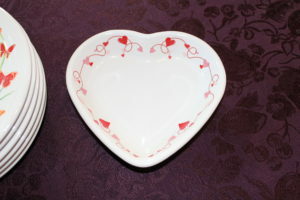 At the same time I bought my Fiesta Butterfly plates, I found this lone cute Fiesta heart bowl, obviously made for St. Valentine’s Day. I can’t wait to use it for a special meal for my honey, Jamey! St. Valentine’s Day is very special to us, so we like to celebrate in quiet but meaningful fashion. Fiesta Heart bowl. What delicious meal will I make for my honey? Soup? Dessert? I have a few months to decide!